I toyed with this piece for a couple of days before finally deciding this morning that this is "it". 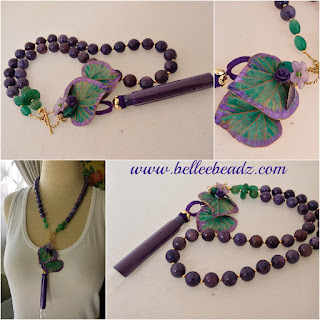 I love the colour combination - purple with shades of green and gold. 12mm Jasper beads, handmade clay leaves, deep aubergine silk tassel and a smidge of green in the jade rondell and green agate beads......stunning in reality. Tassel is encased in a protective wrapper hence the 'stiffness'.